It only takes a quick search on the internet to find all kinds of misguided theories on why driving horses wear blinders. 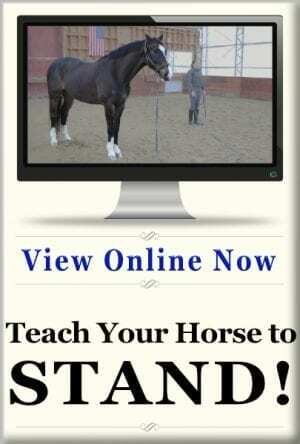 The most common reason given is that they are used to keep the horse from being distracted. Speaking of distractions, the search will no doubt soon lead to a path that will have you reading about how blinders are one of human kind’s great cruelties to horses. These posts will no doubt be countered by those with equal vitriol that no horse should ever be driven without blinders. To cut through all of the noise and clutter of emotional responses to a practical consideration, let’s take a look at why blinders came into use in the first place. A horse’s eye, specifically the retina (the part that turns light into images), is built very different than ours. Rather than using the whole retina to view objects near and far, the horse’s retina has segmented areas, one for near, and one for far vision. The eye is positioned on the horse’s head such that when the horse is grazing, the far-sighted portion of the eye is higher on the horse’s head. That’s perfect for scanning the horizon for potential threats. Think of it as a motion detector, keeping guard against lions, tigers, and scariest of all… blowing plastic bags! This part of the eye is hard-wired into the horse’s flight response zone. 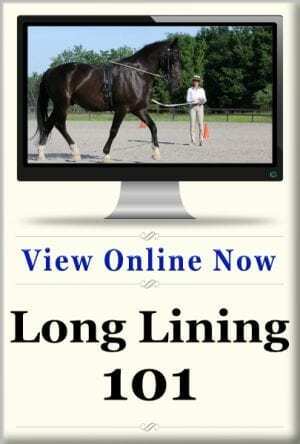 When the horse’s head is held in a typical stance position, such as when we are working, that far-sighted portion of the eye gets tipped up and back. So the motion detector is primarily pointed behind the horse. Pretty much exactly where the carriage is hitched to him. Of course, that part of his vision is designed for spotting far-off objects, so chances are the carriage is too close to be in focus. Let’s add to this formula by considering that most successful predators would attack a horse from behind, rather than the side or front. Watch the Discovery Channel sometime, and you’ll see this over and over again. That means the carriage, which he has a hard time seeing clearly, occupies the horse’s mortal threat zone. Wait! There’s more! Once hitched to the horse, the carriage mimics the horse’s every movement, just as a stalking predator would. With all of this in mind, it’s no surprise that most horses are more comfortable being driven in a bridle with blinders. It saves them the trouble of having to outthink their evolutionary instincts. So Why Drive With An Open Bridle? Everything that I just told you makes a pretty convincing argument for using blinders on driving horses. So why would you chance going in an open bridle? I’ll never forget the first horse that I decided to use an open bridle on for driving. He was a fancy Trakehner with a heart of gold and beautiful movement. He had grown up as a ridden dressage horse and had the movement to prove it. His person rightfully thought that combination would be brilliant in a carriage, so we taught him to drive. He was a good boy for all of his training and took to the carriage fairly well. That said, his attitude and movement in the carriage just weren’t the same as when he was under saddle. He just wasn’t the same horse. In trying to understand what to attribute the big change to, I did a fair amount of long lining. I was able to observe that on the long lines in an open bridle, he was the same reliable, fancy pony we knew under saddle. The change came when we put the driving bridle on. Despite years of professional advice that I’d been given about never driving a horse in an open bridle, we decided to drive him in his riding bridle. He loved it! The fact was, that this horse had experienced his entire life without blinders. So he was used to seeing the whole world around him all of the time. He could hear a noise, look at the source, and discount as a non-threatening. In the decades since that experience, I’ve found this to be the case with many horses who come to driving as a second career. But it’s not just the second career horses that prefer to see the world around them. I owned an American Saddlebred who was hotter than the sweatband in a fireman’s helmet. Since he had only ever been a driving horse, he never had an open bridle on until I started him under saddle. Still, I used a regular driving bridle for his work in harness. However, his previous owner always insisted that she felt he’d be more comfortable in an open bridle for his driving. Honestly, I thought she was nuts. One day while tacking him up, a friend put the reins on the harness in the moment just after I had put his driving bridle on. He reacted by throwing his head straight up, and when it return, it landed on the top of my head. When I recovered, I decided it was time to give the open bridle a try. The open bridle made a huge difference for his comfort and confidence. Sure, he was still a firecracker of a horse, but that was just because he thought that anything he could do would be more fun if he did it faster. However, in the open bridle, he was more relaxed and open to communication. He was just happier. We went on to many years of successful competitive and recreational driving with him wearing the open bridle. Of course, those driving in pleasure shows should be aware that the judging can be fairly subjective. Judges tend to prefer the most traditional looking turnout possible, which indicates that blinders would complete the turnout. 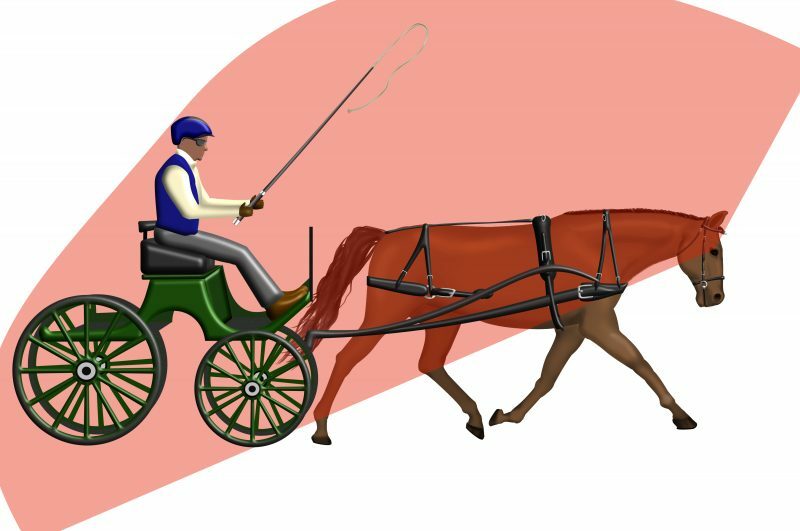 One of the biggest problems with horses being driven in a bridle with blinders is what happens when a bridle is unseated while the horse is hitched. 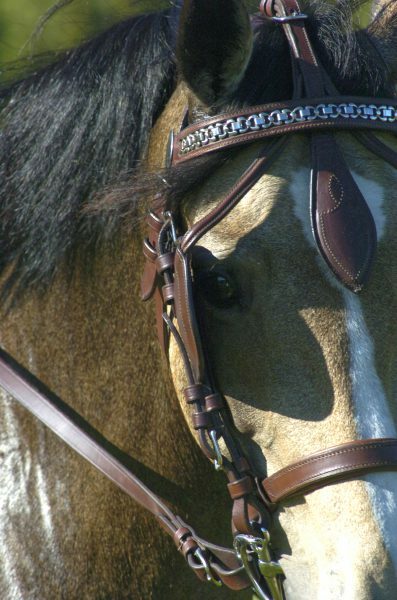 The bridle doesn’t have to come all the way off to create a problem. A simple head shake or rub can displace the bridle enough for the blinder to be moved out of the horse’s vision. For many horses, this is their first sighting of the horror that has been going on behind them for years. Everything described in the first section of this article drills right into the horse’s flight instinct, and you’re off to the races. 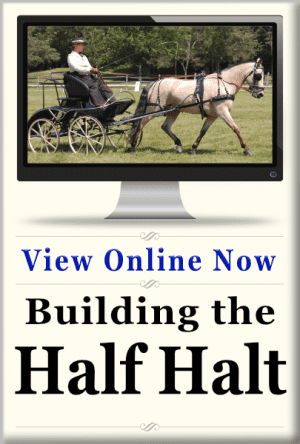 Once my eyes were opened to the possibility of driving horses without blinders, I began to change how I introduce horses to carriage driving. As the horse progresses through the stages of ground driving, dragging tires, and wear false shafts, he does so in an open bridle. In many cases, the horse makes it all the way to the carriage and can be driven comfortably in an open bridle. All of that said, most horses eventually need blinders. It takes a lot of mental energy to ignore the signals they are getting from their nervous system that there is an object in their predator threat zone. The blinders allow the horse to ignore those instincts and relax as a driving horse. However, if that bridle does become unseated, they are not seeing the carriage as it’s hitched to them for the first time, so their reaction is usually quite reasonable. Should You Try an Open Bridle? You might make the mistake of reading this article as an advocacy for driving all horses without blinders. That is not what this is at all. It’s simply stating that some horses are more comfortable with blinders while others are not. There’s no hard and fast rule that horses are willing to follow on this matter. It has to be evaluated on a horse by horse basis. 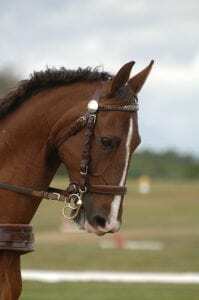 There are a few indicators that a horse may go better in an open bridle. The most obvious sign is that the horse goes from Steady Eddy to Freaky Frank as soon as the driving bridle goes on. 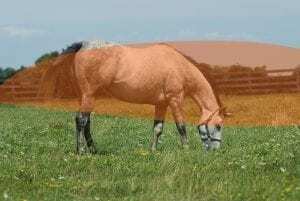 If the horse spends excessive time shying from noise and trying to swing his head in the direction any noise, he may just be trying to see the noise and eliminate it as a threat. 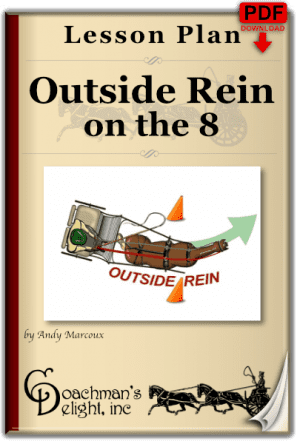 However, if you were to go out to the barn today and explain to your long time carriage horse “Andy says you might go better in an open bridle,” you might be in for an unpleasant surprise. Taking the blinders away from a horse who hasn’t learned the sport without blinders can be far more exciting than you bargained for. This could be a source for a horrific runaway that won’t end until the horse gets stuck or completely removes all evidence of a carriage having been attached to him. If you do have an idea that your horse may go well in an open bridle, you’ll be better served to take careful incremental steps. The simplest step is pushing the blinders as wide as possible. If there is an improvement there, I would move on to using a half blinder. Sometimes that’s all it takes for a horse to feel a little more relaxed. If there seems to be motivation to continue on the project to drive in an open bridle, it’s time to have a full re-boot as a driving horse. 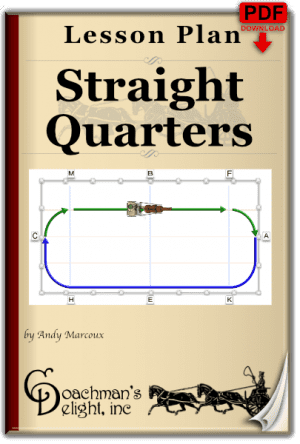 In my practice, I approach this project as if I were teaching the horse how to drive all over again, only this time with an open bridle. I’ll take it down to the most fundamental steps. I will ground drive the horse completely harnessed, however in an open bridle. If that goes well I’ll move on to dragging a tire, using false shafts, and pulling the carriage around behind the horse without hitching it. I frequently drive the horse as a leader in a tandem, to gauge his reaction. 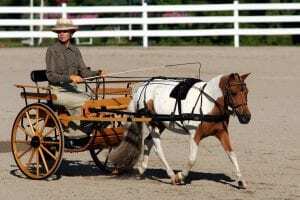 Only when the horse has proven himself to be comfortable with all of those tests in an open bridle would I consider actually hitching to the carriage while the horse is in an open bridle. This isn’t something that I do in an afternoon! It takes many sessions to move through all of the phases of this project safely. If you choose to go down the open bridle path, keep a close eye on your horse’s reactions through every step of the process. If you see tension building, don’t push your luck. There’s no reward in having a broken horse just because you wanted him to go in an open bridle. In my experience, most horses are more comfortable driving with blinders of some sort. They allow the horse to focus on the job at hand without having to worry about the carriage moving around in their predator warning vision. However, a smaller number of horses just want all of the information they can have about what’s going on in the world around them. Each of these horses will work more confidently and comfortably with the equipment scenario they prefer. It’s your job to understand your horse’s comfort level. If your horse is going in an open bridle, don’t do a lot of hand-wringing about getting blinders on him. If your horse is more comfortable with blinders or half blinders, let him be comfortable. As always, make it safe and make it fun for both you and your horse. The bottom line with this, as with EVERYTHING you do with a horse (or dog, or child, etc…) is simple: ALL horses are INDIVIDUALS. No one size fits all. Whatever you do should be tuned to making *that* horse the best and happiest horse he or she can be. Don’t follow ANY dogma, whether it’s claimed to be ‘the ONLY way’ or not. Listen to your horse, and find out what works for THEM. That’s the only way real success can be achieved. It’s also the only way you will become a HORSEman/woman, rather than just another horse-user. Exactly the message I’m trying to get across Karen. Dogma is a dangerous thing. Love your “horseman/woman -v- horse-user” analogy. 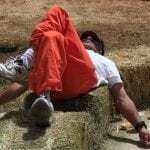 Thank you for the great article and this wonderful website, there is so much great information on it. I am going to monitor it regularly. I always start my horses in an open bridle. I am working with one now that I drive all the time in an open bridle in the ring. However when riding on the trail he will shy at small birds, spin and bolt (there is a story of why but I won’t get into that). When he bolts he is not on a frantic runaway and I can stop him quickly, but, because of that I have not driven him on the trail. So I figured it was time I introduce him to a bridle with blinders. Well his first little exercise with blinders told me he hates them, so I am not completely sure what I should do about it. Should I put one on him in a corral and let him figure it out for himself? Do you think a bridle with blinders will help? That’s a tough call. I’d say there needs to be work on the bolting issue. That may not have anything to do with blinders or not if it’s an issue under saddle. If he’s worse with blinders, it doesn’t sound like a solution to me. At the driving club some teamsters use blinder bridles others don’t. For whatever reason I have had a small pony and harness since I was a teen, seems they often come with this paraphernalia or that we acquired ponies that also drive. We primarily ride. We are in Canada and we are a winter bound country it seems. After 30 years of hauling in to heated arenas to ride, we gave it up as it is 3 to 4 hours of your day gone each time, away from the farm. I got this idea to drive the ponies in the winter. We have all this “Horse power” standing around the farm and the small pony, we bought as a school pony, also drives and is doing all the work. I Started with my very quiet Warmblood Pony Stallion he is 14 this year i think, We thoroughly ground drive everything before we ride them and lunge jump them over all kinds of obstacles before riding. The Stallion is a well trained brave eventing pony. I used his open figure eight bridle to start him with mainly because it has a full cheek bit on it in case we have to pull him in with the ‘safety lunge line’ and not pull the bit through his mouth, and because the figure eight noseband gives a bit more control. We had ponied him for at least 10 years alongside our vehicles, up and down our quiet country road, for winter fitness along with other horses, we then ponied him alongside the small pony on both sides of the jog cart with runners on, then we took a plastic ‘Calf/hay’ sled and drug it behind the jog cart/sleigh fastened with a wrap of rope so we could free it in a wreck, like a forecart, so he heard and saw that noise behind him, from both sides before we started dragging things behind him. We also lunged him Walk trot canter in full harness and this was a smart thing to do. The reason is, I think, because horses should feel the breeching and crupper riding up and down their hind ends in canter, or as he went in gallop the first times, on a line and NOT when they bolt on a hitch! This pony stallion’s nickname is Eeyore he is so laid back, and all this ponying and driving and dragging things he has taken in stride. Cantering with crupper and breeching……… ooo whee! That has scared, upset him the most when i asked him to canter. He could have been a rodeo bronc and I have not seen him react to any aspect of his training under saddle or this initial harness training as much as his reaction to cantering with breeching on. So we lunged him with harness on until picking up and going in canter was not an issue. While watching him go (and hanging on for dear life) i thought, “What if something spooked him whilst in a hitch and he scooted ahead and felt that breeching riding up and down for the 1st time then when worried? Trotting really hadn’t bothered him much but cantering surely did. We have now graduated from tire on straight and on a circle to travois. He’s still in an open bridle. I want to drive him in a pair (yes he’s good with other horses) and thought before that should we put blinders on him to keep him focused? The reaction to the breeching isn’t that unusual. Lot’s of second career ponies find that a little weird at first. 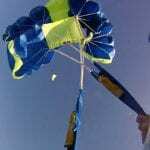 Longlining in full harness is usually the best place to work that out. As far as introducing the blinders at this stage, I’d say only if you feel that something isn’t right with the open bridle in his driving. I’ll agree that STB’s are AWESOME! Fun website that you’ve pointed us to. I like the concept of the complete disconnect that dropping the blinders and bit provides from the racing world. There are very smart horses who simply can’t effectively filter out the instinctual response to movement in the danger zone of their vision. I’ve had horses that go willingly in the open bridle for driving, but are just more comfortable with blinders. It just saves them the trouble of having to ignore the visual noise of the carriage. Either way, it still comes down to the right thing for the horse at hand. Thanks for putting in your comment! Hi Andy, I also had one of those HOT horses… he was 1/2 QH & 1/2 TB. His younger years were spent doing trail riding eventing, jumping and dressage, but he was always too hot to be settled enough to be very competitive. 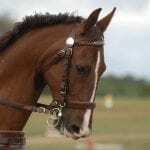 At home, I would lead him along side as I drug the jumps around my arena. When he was 17, I started training him for harness, I did so open and he was very accepting of all the ground work. I took him to a friends to start the dragging and pulling part. (I did not want to do this part without knowledgeable help.) He was so accepting that we were very surprised when we were able to pull a tire while long lineing on a circle as well as ground driving like he had done so for years. That went so well we added a travois to the game. Again, there was no reaction… We spent about 45 minutes at the former tasks. Next came the cart, and again he was just great, even when we asked for a trot. I came home and the next day, hitched him to my BIH flyer…. again no reaction. I even drove a CDE that fall and went to a lesson with the inspection team for the Freisian keuring. He was wonderful, but still a hot cookie. I spent a good year driving him open but, his attention would briefly leave to explore more interesting things in our surroundings. He was not afraid, just a lookie lou. I added the blinders, pulled as open as I could get them, to see if he would be a little bit more in tune with my signals. Sure enough, it worked and he spent the rest of his driving days with them. Oh, he also tried to buck me off a couple years later when I rode him instead of driving him. He was adored by me, and a few well known driving instructors. He LOVED being a driving horse. I’ve had this experience with many horses. They can be perfectly well mannered in an open bridle for driving, but then just a bit better with blinders. So it’s always a horse by horse decision. When I started driving half a lifetime ago, my coach taught me to start every horse in a open bridle. Then transition to blinders as training progresses. This was driven home to me when I was giving my friends young daughters a ride in the cart. My pony shook his head, jumped a little and kept on going. When we had finished our circuit of the hay field, she stopped to discover that the bit was the only part of the bridle still attached to his head! He had taken the complete loss of his bridle, completely in stride. (Pardon the unintended pun). 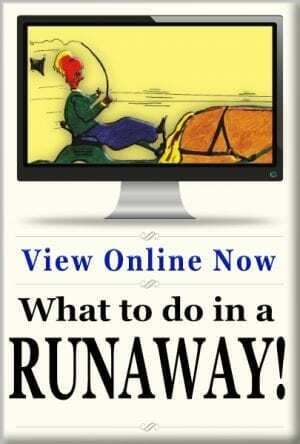 I have also seen a runaway with a pair of green ponies at a show. One had rubbed his head on the other and dislodged his blinder. They ran for more than 20 minutes before the carriage finally broke free. I could go on and on with stories like these. Both good and ugly. My point exactly. It’s better if they get an eyeful of the carriage, it isn’t the first time they are seeing it.